Roasted Red Pepper Dip with Feta and Mint is perfect for a summer get-together. This tasty dip is low-carb, low-glycemic, meatless, gluten-free, and South Beach Diet friendly. Click here to PIN this Roasted Red Pepper Dip with Feta and Mint! How do you feel about hot weather? I’m a fan of summer, and for weeks I’ve been complaining about the rainy spring we’ve been having in Utah. But the weather changed while I was in Austin for the IACP Conference and now it’s so hot in Salt Lake that I turned my air conditioner on today! Hot weather makes me think about nibbling instead of eating big meals, and this delicious Roasted Red Pepper Dip with Feta and Mintis perfect for a snack, but also flavorful enough to serve for a party. This recipe starts with a jar of roasted red peppers, drained very well and then patted dry with paper towels. I chopped the mint while the peppers were draining. Puree and red peppers and the minced garlic in a food processor. Add the cream cheese, feta, fat-free Greek Yogurt, chopped mint, lemon juice, olive oil, and salt and process until the the mixture is well-blended. I ate some of the dip with celery and snow peas, for a light summer lunch. This would also be delicious as a sauce for grilled chicken, fish, or vegetables. This tasty dip is perfect for a backyard summer party. Put a colander in the sink and dump in the jar of roasted red peppers. Let peppers drain well, then pat dry with paper towels. While the peppers drain, finely chop the mint. Put red peppers and minced garlic into a food processor and process until peppers are pureed. Add cream cheese, Feta, fat-free Greek yogurt, mint, lemon juice, and olive oil and process until well blended. Taste to see if you want to add salt, and process again if you do. Serve dip with raw veggie dippers like celery, sugar snap peas, jicama, or cauliflower, or cooked vegetables like asparagus, green beans, or broccoli. This is also good as a spread on sandwiches or as a dip for whole-wheat pita bread. The dip will stay good in the refrigerator for several days. Let come to room temperature again when serving. This recipe adapted with minor changes from The South Beach Diet Super Quick Cookbook. When made with low-fat cream cheese and fat-free Greek yogurt, this Roasted Red Pepper Dip with Feta and Mint would be approved for any phase of the South Beach Diet. If served with low-carb veggies like celery, sugar snap peas, jicama, cauliflower, asparagus, green beans, or broccoli it would be perfect for a low-carb snack. Barbara, thanks. I really liked the feta in this! I have had red pepper dip with hummus as a base. I like the sound of this with cheese and yoghurt. TW, me too, and I think this would be even better with freshly-roasted peppers if you get some from the farm! I like the firey hot color for summer combined with cool feta and mint. So glad you liked it, and I can definitely imagine a spicier version of this being great! I made it today. I added some spicy elements to it though since we like spicy food. My 4 year old kid to 75 year old FIL loved them. Thanks for such an easy and delicious recipe. Great meeting you too, and so glad this was a hit. Kalyn- it was great to see you in Austin. All the better that when I went looking for a red pepper dip this morning for a colleague's shower, you had just posted this bit of delicious. Thank you- I just got a whole lot of raves! Dara, looking forward to seeing you too. The mint was so good in this. Susan, there are so many things I love that have mint, like Fattoush, Tabbouley, and now this dip! Just planted 4 more mint plants for a total of 8 in my new divided herb bed. I can't wait to hear about your IACP experience in detail! This dip is the perfect thing for summer – easy and pretty. The addition of mint is the perfect way to add another layer of flavor. Judith and Jessica, fun meeting both of you two, and I just subscribed to both of your blogs! This dip looks fabulous Kalyn! The flavors sound truly incredible. It was wonderful meeting you at IACP last week. Have a great one! Enjoyed meeting you in Austin at lunch, Kalyn, and am now drooling over your delicious blog! Love the great recipes! I agree with you that teaching is a great preparation for lots more things in career and life. My best to you. Rosebuttons, how great to hear that. I'm find a lot of interesting recipes in that book! Great minds…you know what they say 🙂 Today is my second day on the SB Phase 1, and I bought the Supercharged Super Quick Cookbook yesterday, planning to make this recipe today!! Thanks for the post and your informative website, don't think I would have started this new lifestyle without your site! Kellypea, my fabulous brother is the one who does the headers. We change the middle part every month for the season. I'm so lucky to have him to help me. Joanne, it was a perfect lunch for me! I'm getting more and more into light meals lately also! Salads, cold soups, etc. This dip looks perfect to dig into with some crudites and pita wedges! Jeanette, I think I've also had that Greek dip with red peppers. Maybe this recipe was based on that one? I would love it on grilled fish too! 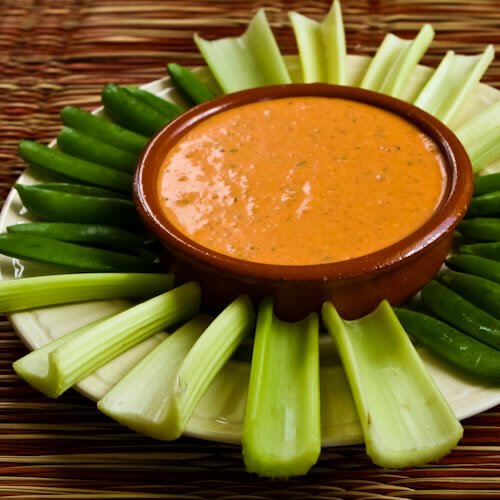 Kalyn, this roasted red pepper dip looks so nice and creamy, even though it is low in fat! This reminds me of a dip I just had at a Greek restaurant we visited this past weekend. I bet this would be good on top of broiled or grilled fish. Sharan, welcome and it was fun checking out your blog. Chris, I know what you mean about that stop button issue. Lydia, I'm thinking this could only be even more awesome with freshly roasted red peppers. I just made a huge batch of roasted peppers on the grill — perfect timing! I'll set the red ones aside to make this dip. You had me at Roasted Red Peppers. One of my favorite foods ever. Looks deicious! I'm thinking with grilled shrimp. Susie, I think this would be good with grilled chicken; great idea! Great ingredients! I might also try this as an accompaniment to grilled chicken. Kelley, I loved it. And loved the color too. Champa, I like the idea of using ricotta. It will probably need a bit more salt and I might add more lemon juice (unless you want a milder dip.) Let us know how it turns out. Maris, thanks so much. My best camera is still in the shop, so I was happy I could still get okay photos with my old Rebel. Not only does this sound delicious, but I love the photo! So pretty! I am making it. I probably will use ricotta instead of feta since that is what I have on hand. Cool recipe. Wow! This sounds so delicious! I'll bet this is delicious! I'm always looking for a new dip to enjoy.